US department store retailer Macy's has revealed that Michael Gould, chairman and CEO of the Bloomingdale's brand, has stepped down after 22 years at the helm. Prior to Bloomingdale's, Gould worked at Giorgio Beverly Hills as president and COO before being promoted to CEO in 1987. He previously held various roles at the Abraham & Straus division of Federated Department Stores. He will be replaced by Bloomingdale's president and COO Tony Spring on 1 February. A successor to Spring as president of Bloomingdale's will be named next year. Spring has held a number of positions at Bloomingdales over the last 26 years, such as senior vice president for home furnishings and executive vice president for marketing. CINCINNATI--(BUSINESS WIRE)--Oct. 30, 2013-- Macy’s, Inc. (NYSE:M) today announced an upcoming change in leadership at New York-based Bloomingdale’s. After an illustrious 22-year career as Bloomingdale’s chairman and chief executive officer, Michael Gould will be succeeded in that role by Tony Spring, currently Bloomingdale’s president and chief operating officer, effective Feb. 1, 2014. “Leading this great brand and organization to a new level of success over two decades has been a great privilege. I feel that now is the appropriate time for a change for both the company and myself,” Gould said. “Mike Gould has been an outstanding and inspirational leader who has strengthened Bloomingdale’s position as an upscale fashion trendsetter known and loved by customers around the globe. Bloomingdale’s truly is like no other store in the world,” said Terry J. Lundgren, chairman, president and chief executive officer of Macy’s, Inc. “Tony Spring also has been an integral part of Bloomingdale’s formula of success for 26 years, and we are excited about his new, elevated role leading this exceptional omnichannel brand going forward. “Bloomingdale’s has been pursuing multi-dimensional growth opportunities. These include strategic omnichannel integration of 37 Bloomingdale’s stores, bloomingdales.com and related mobile applications to serve the rapidly evolving nature of consumer demand. In addition, Bloomingdale’s initiated an international store presence in Dubai in 2010, international shipping to more than 100 countries beginning in 2011, and a Bloomingdale’s Outlet store strategy that now includes 13 locations across the U.S. opened over the past three years. We see nothing but continued growth and opportunity ahead,” Lundgren said. A successor to Spring as president of Bloomingdale’s is expected to be named in 2014. Gould, 70, joined Bloomingdale’s as chairman and chief executive officer in 1991. Previously, he was president and chief executive officer of Giorgio Beverly Hills, a position he had held since 1987. He joined Giorgio in 1986 as president and chief operating officer. Gould began his retailing career at the Brooklyn-based Abraham & Straus division of Federated Department Stores, Inc. in 1968 as an executive trainee and rose to become a merchandise vice president. In 1978, he joined J.W. Robinson’s in Los Angeles in a senior merchant role, and in 1981 became Robinson’s chairman and chief executive officer. A native of Boston, Gould holds bachelor’s and master’s degrees from Columbia University. He lives in New York City with his family. Spring, 48, was promoted to Bloomingdale’s president and chief operating officer in 2008, with responsibility for Bloomingdale’s stores, marketing, creative services, finance, operations and restaurants. He began his Bloomingdale’s career in 1987 as an executive trainee in the White Plains, NY, store. Over the next eight years, he assumed positions of increasing responsibility in the home furnishings area before being promoted to senior vice president for home furnishings. In 1997, Spring was named senior vice president for marketing. A year later, he was promoted to executive vice president for marketing; and in 2003, added bloomingdales.com, Bloomingdale’s by Mail and restaurants to his responsibilities. In 2004, Spring was named senior executive vice president responsible for marketing, Bloomingdale’s Direct and restaurants. A year later, he was promoted to senior executive vice president and director of stores, with additional responsibility for Bloomingdale’s shopping services and creative services. Spring, a native New Yorker, is a graduate of Cornell University. He and his wife, Grace, live in the New York City area with their two children. Macy’s, Inc., with corporate offices in Cincinnati and New York, is one of the nation’s premier retailers, with fiscal 2012 sales of $27.7 billion. 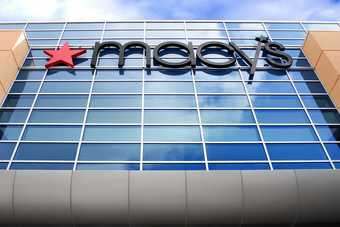 The company operates about 840 department stores in 45 states, the District of Columbia, Guam and Puerto Rico under the names of Macy’s and Bloomingdale’s, as well as the macys.com and bloomingdales.com websites. The company also operates 13 Bloomingdale’s Outlet stores. Bloomingdale’s in Dubai is operated by Al Tayer Group LLC under a license agreement.